The following is a re-post from ASI Weekly. The How to Handle Sheep video series released by the American Sheep Industry Association, in collaboration with Temple Grandin, Ph.D., the Livestock Marketing Association and Colorado State University, is approaching 10,000 hits on YouTube. The three-part video details the process of handling sheep through the entire life span of the animal. The training tool is available in English and Spanish. From producers and auction-facility workers to the transportation industry and harvesting personnel, everyone can follow Dr. Grandin as she discusses the best practices to use in handling sheep. 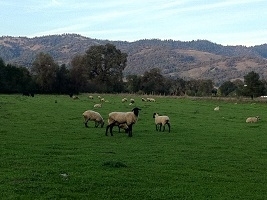 ASI Executive Director Peter Orwick strongly encourages all sheep operations to ensure their livestock workers, whether full- or part-time employees or neighbors, are educated. "These videos are a convenient way to accomplish this goal," said Orwick. "Poorly trained or uneducated workers who help with sheep are a business liability that is not necessary with today's access to training." The University of California Division of Agriculture and Natural Resources is seeking a Cooperative Extension Advisor who will serve UCCE Placer-Nevada and Sutter-Yuba Counties with headquarters in Auburn, CA. Please help spread the word about this position that will focus on integrating livestock, natural resources, food systems and economics. A minimum of a master's degree is required, though other advanced degrees are encouraged, in disciplines such as animal science, rangeland management or other closely related fields. Incumbent is required to become a Certified Rangeland Manager within five years of date of hire; see http://casrm.rangelands.org/HTML/certified.html. Excellent written, oral, and interpersonal communication skills are required. The ability to build partnerships and to work with multidisciplinary teams to address production and environmental challenges is required. Experience in applied research and extension is preferred. SUBMIT BY date for full consideration is Monday February 27, 2017. It is position #AP16-20. See the web link http://ucanr.edu/Jobs/Jobs_990/?jobnum=1123 for access to the full position announcement and required academic application form. Questions about this recruitment may be directed to Karen Ellsworth: Phone: 530 750-1284; kaellsworth@ucanr.edu.